There are many horse races that take place around the entire world ranging from the southern state of Louisville, Kentucky all the way to the exotic deserts of Dubai. Below you’ll find a list of the top ten horse races in the world according to Lady And The Track. These horse races are held in the highest esteem and respected by royalty and horse racing fans alike. The Cheltenham Festival is #10 on the Tope Ten Horse Races In The World list. The Cheltenham Festival horserace is all about pride matching Ireland against Britain. The Cheltenham Festival is the most prestigious meeting in the National Hunt racing calendar. The Melbourne Cup began in 1861 and brings Australia to a complete standstill. Marketed as “the race that stops the nation”, is said to be the most prestigious 2-mile handicap in the world. This race brings out crowds from every corner of the world. The Dubai World Cup in the newest on our list, beginning in 1996. The Dubai World Cup takes place in Dubai, United Arab Emirates annually. This horserace has been rapidly building a loyal following. Like the Kentucky Derby and Royal Ascot, the prestigious Dubai World Cup is as much about fashion as it is horseracing. Reaching #7 on Lady and The Track’s list of Top Ten Horse Races In The World is The Prix de ”Arc de Triomphe. The Prix de l’Arc de Triomphe horserace is held in Paris, France usually the first Saturday in October. It is considered one of the most important races held in Europe annually. The race was named to honor the French soldiers who fought in WWI. The Prix draws in competitors from all over the world. The winner of The Prix de l’Arc de Triomphe receives $10,500,000, making for one of the richest paydays in all of sport. The Breeders’ Cup is a thoroughbred horserace that takes place at a different location each and every year. The Breeders’ Cup allows 14 starts in each of its 14 races with exception of the dirt mile, which allows 12 starters. The Breeders’ Cup usually awards over $30 million during the two-day event. The halfway point of our Top Ten Horse Races in the World is the Belmont Stakes. The Belmont Stakes is held at Belmont Park in Elmont, NY annually in June. The Belmont Stakes is the last race of the Triple Crown series. For 140 years, fans have filled the park to watch the horse race. Belmont Park is special because unlike other tracks in the country, Belmont hasn’t inflated their prices. Though the third leg of the Triple Crown could potentially be a huge payday, the gate price remains the same, making this race an event everyone can attend. 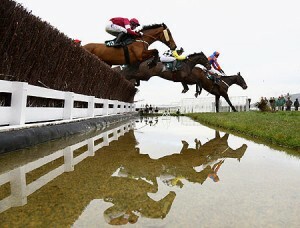 The Grand National places #4 on The Top Horse Races In The World list. The Grand National is held In Aintree, England near Liverpool. 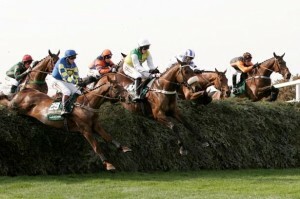 The Grand National is more than your ordinary horserace. The National Hunt Horserace includes 30 fences to jump before finishing the 2-mile course with a straightaway. This grueling test of skill and endurance leaves fans mesmerized as they witness the spectacular display of athleticism put forth by these remarkable racehorses. Amateur trainers and jockeys are encouraged to participate in this race. The Preakness takes place at the Pimlico racetrack in Baltimore, Maryland each year. The fan-favorite horserace takes place on the third Saturday in May. The Preakness is a party for the people. This second leg of the Triple Crown is highly anticipated by anyone who follows American horseracing. The winner of the Kentucky Derby becomes an automatic fan favorite, as they hope the horse can repeat with a win and inch one race closer to the Triple Crown title. The number two race goes to the Royal Ascot is the Kentucky Derby of England, but classier. It’s more than a fancy horserace; it’s a chance for the wealthy to showcase their prized thoroughbreds. The dress code for the Royal Ascot is strict and requires that all in attendance be dressed in proper attire. The race consists of 24 separate races held over a 4-day period. 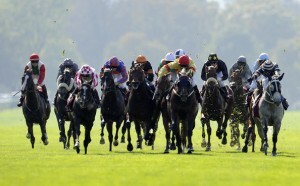 The Royal Ascot is clearly associated with the British Royal Family and is located only six miles from Windsor Castle. The #1 Top Horse Race In The World is The Kentucky Derby. 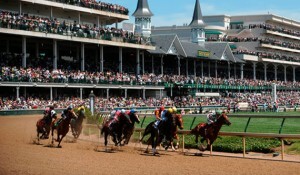 Our number one spot is the Kentucky Derby in our list of Top Ten Horse Races in the World. The Kentucky Derby is held the first Saturday of May in Louisville, Kentucky. All horseracing lovers know it’s time to start the Triple Crown when the Derby comes around. Not only is this a potentially high grossing event for owners and a chance to show off their fresh-out-of-training horses, but it’s also a race that celebrities and the rich and powerful frequent. From a little place in Churchill Downs into the hearts and minds of everyone on the planet, the Kentucky Derby is the undisputed king of all races.